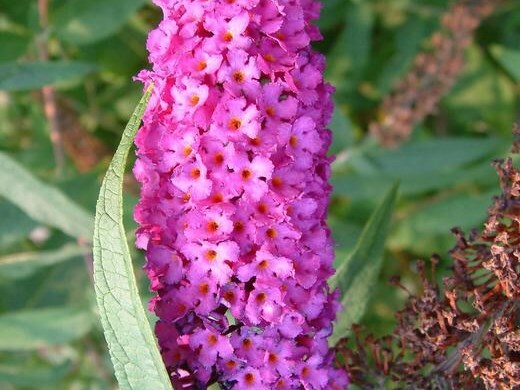 Buddleja davidii (butterfly bush) is a shrub (family Buddlejaceae) with a cluster of pink to purple flowers and narrow leaves found in the San Francisco Bay area and coastal ranges of California, and is invasive in the Pacific Northwest. It is native to China. It favors riparian and bottomland habitat. It is highly regenerative and can spread via dumped garden waste. Seeds are retained on the plant over the winter and they are released in early spring or summer. Seed dispersal can start in late autumn or early winter.